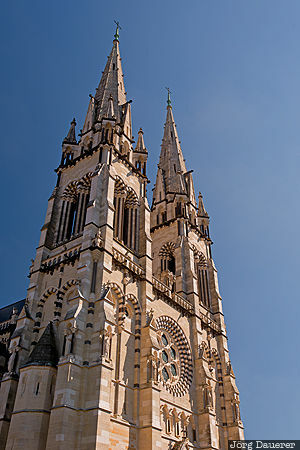 The two imposing towers of Moulins Cathedral Basilica (Basilique Cathédrale Notre-Dame de Moulins) below a blue sky. Moulins is in Auvergne in the center of France. This photo was taken in the afternoon of a sunny day in September of 2015. This photo was taken with a digital camera.